One would be mistaken to believe the recent aggravation of the Syrian crisis triggered by the launch of Turkey’s Operation Olive Branch along Syria’s northern border, which has already resulted in military casualties suffered by both the Turkish and Kurdish sides, came as a surprise for those following the conflict carefully. There’s also no denying the fact that the bloody Turkish-Kurdish confrontation already resulting in a considerable civilian death toll is an avid example of the two-faced policies of Washington, when former allies of the US are now being used as bargaining chips. Back in August of 2016, Ankara would show the world that it entered Syria with a fixed goal in mind that had little to nothing in common with fighting the Islamic State (ISIS). At that time, when Turkey launched an assault on Jarabulus, numerous media experts were not afraid to openly state that Ankara was going after Kurdish armed groups by taking this step. In particular, back then Le Figaro commented on the Turkish invasion of Syria, noting that Erdogan’s assault on Jarabulus was not aimed at the destruction of ISIS, but instead was aimed at countering Kurdish advancements in Syria as this step had already been in the cards, with ISIS serving as a mere excuse. At the time, this position was supported by the German Tagesspiegel which would note that initially Erdogan was supporting Islamists in the fight against Damascus, but when they began to lose their grip over Syrian territories, the Turkish leader decided to step in directly, making it clear from that point on he would be using the fight against ISIS as a pretext for future military actions against Syrian Kurds. Further still, the Swiss Tagesanzeiger back in 2016 was also stressing the fact that the main goal of Turkey’s invasion of Syria was an attempt to prevent the creation of an autonomous Kurdish entity within its borders. These dynamics have potentially enormous implications for the war in northern Syria. They may raise Turkish-PYD tensions in the short term, which the United States will have to manage and factor into its anti-Islamic State strategy. On balance, however, Washington has little choice but to embrace Ankara, a NATO ally, over a controversial militia that is Turkey’s enemy. Having Turkey as a full-fledged partner in the anti-Islamic State fight also will give Washington greater leverage with its Kurdish allies. By reading these lines one can come to a conclusion that Washington was fully aware of the fact that Syrian Kurds have put themselves on a collision course with Turkey, but instead of preventing tragic events we’re seeing today from happening, it preferred to keep quiet about the future clashes between its own regional allies. 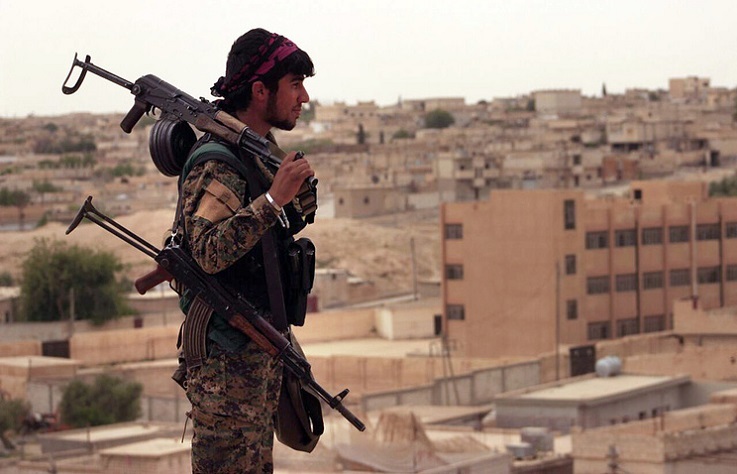 Even back then the The New York Times hinted to its readers that Washington could abandon its support of the Kurdish forces in Syria at any given moment, as it reported that the then Vice President Joe Biden announced that the Kurds had to return east of the Euphrates or risk losing American support. The fact that it’s a risky business being an American ally in any region of the world has been discussed time and time again, and still some of those allies seem surprised when they find themselves being the victims of geopolitical betrayal. It’s also been noted that Washington’s allies are paying a high price in blood for countless military adventures as they are recruited to fight alongside the US in Iraq, Syria, Afghanistan and other regions of the world. One can recall how the new Syrian army was defeated on the battlefield by ISIS militants, when US Air Force aircraft abandoned them at their most crucial moment. Back then the Pentagon-backed Mutasim Brigade claimed one of the air strikes hit the brigade itself. Furthermore, one can recall how in July of 2015, the so called “worst friendly fire incident” in Afghanistan occurred when ten Afghan soldiers were killed and many more wounded after their compound was fired on by US military helicopters. The true goals that Washington is pursuing in Syria have been recently revealed during a joint press conference of US Vice President Michael R. Pence with Jordan’s King Abdullah II in Amman. In particular, he pointed out that the United States remains committed to its perpetual military presence in Syria, not only to fight ISIS but to restrain the allegedly hostile steps that Iran is making in the region which are seen as an attempt to counter Washington’s regional ambitions. What is noteworthy is that there’s been no mention of Washington’s plans to protect the Kurds from Turkey. Therefore, one can only remember how much of a risky endeavor it is to take part in one of Washington’s many military adventures, as the only way to save a nation’s young blood is to abstain from such adventures. There’s little doubt that direct military interventions will remain the primary occupation of Washington for years to come.